Thai Son Nam players celebrate with gold medals. 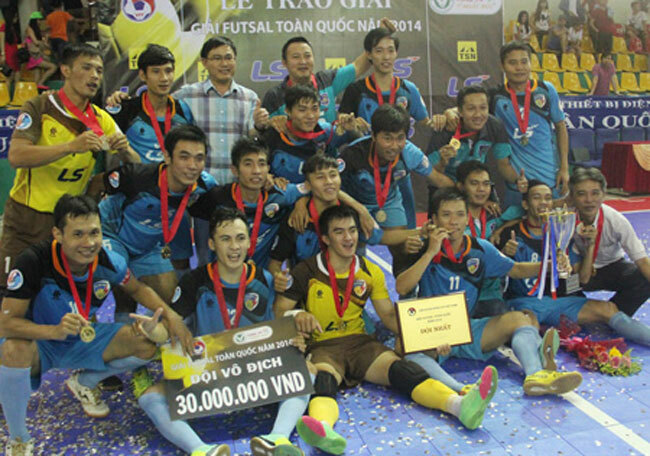 HO CHI MINH CITY (VNS) — Thai Son Nam have defended their title at the National Futsal Championship, after beating Sanatech Khanh Hoa 5-2 in the final in HCM City on Saturday. Visitors Khanh Hoa played better in the first 10 minutes, but they unexpectedly allowed a goal at the 12th minute by Tran Van Vu, who shot into an empty net. Trong Luan scored a double during the next two minutes, when Khanh Hoa had not recovered from the opening goal. Captain Bao Quan made it 4-0 in the first half's last second. Thanh Phong and Minh Nhat narrowed the result for the visiting team, but that was all they could do before a fifth goal was scored by Quynh Toan. It was Thai Son Nam's fifth champion trophy, which they won three years in a row since 2012. They will be Viet Nam's representative at the Asian Futsal Club Championship next month, also in HCM City.